When Spike (a character inspired by the critically endangered axolotl) is struggling to validate his monster appeal, he learns that friendships have more value (especially when they start with a nice smile). 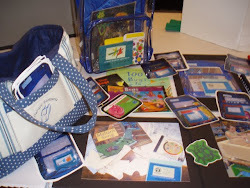 The integration of other creatures from Mexico and the inclusion of Spanish words (and glossary), give the characters and setting authenticity and gives the reader more meaning to construct schema from. 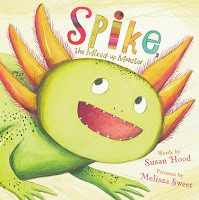 I love Melissa Sweet's art style, and she continues to find just the right elements to make each picture feel like a stand alone piece of art in Spike. 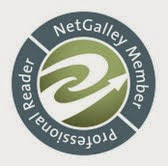 After reading the story I read the informative text in the More About Spike and His Amigos section and was completely empathetic for each of the "characters' and who they represent in nature. 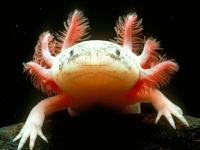 Save the axolotl! 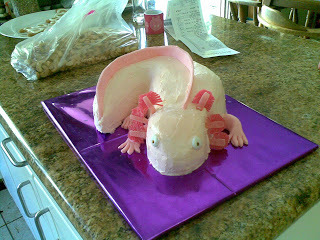 Found this axolotl cake and had to share...so cool...lots of photos on blog (like photo shown)!